The Djinn returns, granting wishes to and extracting payment from prison inmates. The original Wishmaster movie was obviously no classic, but it remains one of 1997’s most creative and entertaining genre films. The movie had a decent script (by regular Hellraiser scribe Pete Atkins) and was directed with some vigour (by former KNB visual effects whiz Robert Kurtzman). If you study the key credits of Wishmaster and its sequel you’ll be hard-pushed to find any common links. In fact it’s only Andrew Divoff, reprising his dual role as the Djinn and his alter ego Nathaniel Demerest that provides any tangible continuity. The sequel, directed by The Hidden and A Nightmare on Elm Street 2’s Sholder, begins with the Djinn being released during a robbery at an art gallery. During the raid a security guard is shot and Demerest, who gleefully admits to the crime, is arrested and sent to prison, where he grants wishes to the eager inmates and begins to collect the souls he needs to gain ultimate power. Only the intervention of a feisty young woman (Holly Fields) and a priest (Highlander: The Raven’s Paul Johannson) can prevent the Djinn’s ascension. 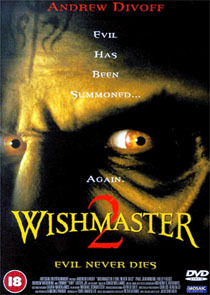 As low-budget sequels go Wishmaster 2 isn’t too shabby, but the mediocre script crucially lacks Atkins’ wit and verve. The special effects are pretty competent, but there are obvious deficiencies, especially in the sound mix, that cheapen the film considerably. Mosaic’s Region 2 disc is a bit of a non-starter when compared to Artisan’s American disc, which features Wishmaster on one side, and Wishmaster 2 on the other. The American disc presents the film in 16:9-enhanced widescreen (1.85:1), and has a Dolby Digital 5.1 sound mix, whereas the UK disc is full-screen and only has 2.0 Dolby Surround. Both versions contain incidental supplements including trailers and cast and crew profiles.